Change the size of the eyepiece fitting of your telescope from 1.25" to 2" with this adapter. Thanks to this accessory from Meade, you can equip every ACF and SCT telescope from Meade with 2 inch accessories and eyepieces. 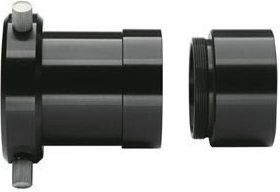 Because of this adapter from Meade you can change the eyepiece fitting of your telescope from a 1.25 inch eyepiece fitting to one of 2 inch. This gives you the possibility to not only use 1.25 inch but also 2 inch accessories and eyepieces on your telescope. For example, you can use a 2 inch filter or barlowlens. This adapter is suitable for all Meade Advanced Coma Free and Schmidt-Cassegrain telescopes. Write a review By sharing your experience with the Meade adapter to 2 inch eyepiece, you can help others (perhaps still doubting customers) with making a good choice.